"Sitting down with Bill Bentley was a real blast for me." says Christian. "First, he sounds like the great commentator with the pleasant Texan drawl, Bill Moyers! He is extremely knowledgeable with a storytellers knack and we just had a lot of fun. I am sure we could've easily continued talking for several hours. Also, I can not say enough about the book. At first, I scoffed at it being just a picture book and catalog of starts through the rock of ages, but the more I picked it up, the more I enjoyed it. In fact, I now consider it one of my prized possessions that I've received since starting the RNRAP!" Bill Bentley is the former A&R Director at Concord Music Group and Vice President of Warner Bros. Records. He has been a drummer, record store clerk, DJ, concert promoter, music producer, and record label publicist. Through it all he has been a writer; in 2007 he received the ASCAP Deems Taylor award. 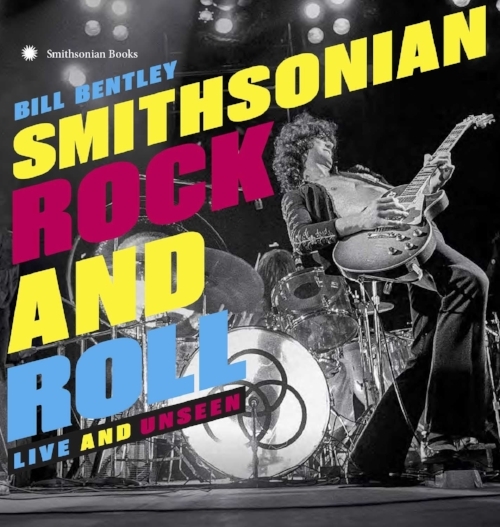 In December 2015, the Smithsonian with Bill Bentley - called on rock and roll lovers around the world to collect photos and stories of their favorite moments in music. Fans dug through attics, basements, closets, shoeboxes, digital cameras, and photo albums to post great rock shots to rockandroll.si.edu. From Woodstock to the Whisky a Go Go, from Lollapalooza to the 9:30 Club, and all the rockin’ places in between, fans overwhelmingly responded with their favorite rock and roll moments. Iconic artists ranging from the Who to Nirvana to Chuck Berry to the Jimi Hendrix and many more are celebrated here. There are early photographs of everyone from Run D.M.C. to the Runaways, and contemporary shots of some of the biggest names in music, including Bruce Springsteen, the Rolling Stones, and Metallica. Presented together, these photographs create a kaleidoscopic history of the artists, the musical styles, the venues, the concerts, and the fans. This is rock and roll as it has never been seen before.